Sofitel Dubai The Palm Resort & Spa promises a luxury beach location like no other. Opposite Dubai Marina, a Polynesian resort beckons with 360 deluxe rooms and 182 serviced apartments, from Classic Rooms to expansive Beach Villas with private pools and butler service. Spend fun-filled days playing tennis or doing water sports off the private beach or relax with a massage and visit. 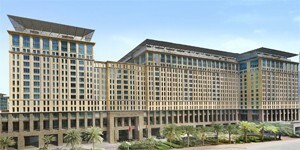 Sofitel brings a 5* French touch to Dubai hospitality for all the family.